Based on years of research in efficient Monte Carlo methods for estimation of rare-event probabilities, counting problems, and combinatorial optimization, Fast Sequential Monte Carlo Methods for Counting and Optimization is a complete illustration of fast sequential Monte Carlo techniques. 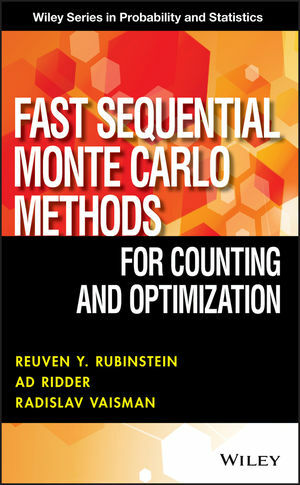 The book provides an accessible overview of current work in the field of Monte Carlo methods, specifically sequential Monte Carlo techniques, for solving abstract counting and optimization problems. Fast Sequential Monte Carlo Methods for Counting and Optimization is an excellent resource for engineers, computer scientists, mathematicians, statisticians, and readers interested in efficient simulation techniques. The book is also useful for upper-undergraduate and graduate-level courses on Monte Carlo methods. REUVEN Y. RUBINSTEIN, DSc, was Professor Emeritus in the Faculty of Industrial Engineering and Management at Technion-Israel Institute of Technology. The author of over 100 articles and six books, Dr. Rubinstein was also the inventor of the popular score-function method in simulation analysis and generic cross-entropy methods for combinatorial optimization and counting. AD RIDDER, PhD, is Associate Professor of Operations Research at Vrije Universiteit Amsterdam. His research interests include rare event simulation, applied probability problems, queuing models, and Monte Carlo methods. RADISLAV VAISMAN is the author of numerous journal articles, and his research interests include rare event simulation, randomized algorithms, and on-line planning.